## Drag & Drop ready! ## Kiosk Mode: Secure your presentation at events, trade shows, conferences, museums, retail and more. PIN to unlock kiosk mode. Configurable timer reset goes to first screen. Autoplay videos automatically loop. -- PRO users only. 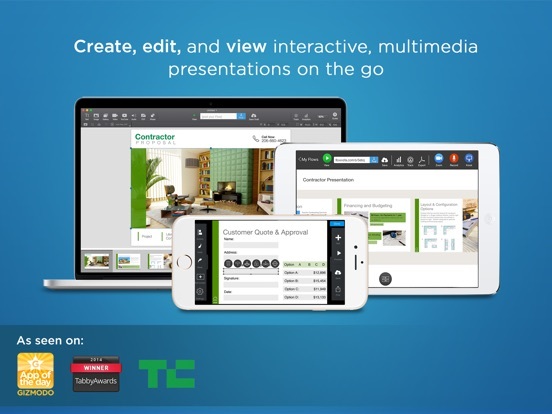 ## Only presentation app that allows you to record video of your presentation! Controls are built for touch, instantly accessible and intuitive. Create using a few simple and familiar touches and gestures. OFFLINE VIDEO - Once video is downloaded to your iPad it just works, no Internet needed. (Not YouTube videos). 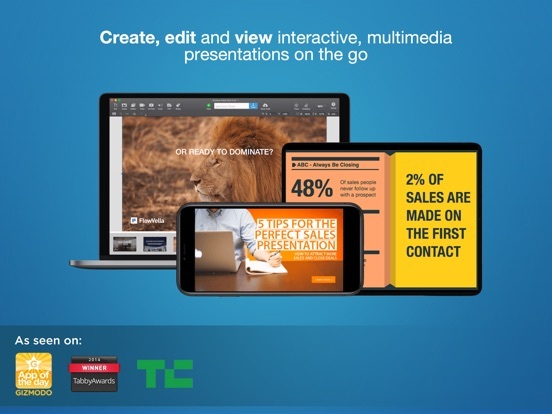 ADD PDFs to YOUR PRESENTATION - Embed whole PDFs within your presentation. Create and share beautiful presentations with images, sounds, GIFs, text, videos, PDFs, links and photo galleries and share with anyone on any device. Bundled with over 25 unique, professionally designed presentation templates for: creatives, pitches, portfolios, reports, video, tutorials, real estate and more. Instant access to any cloud source: Dropbox, Google Drive, Box, Creative Cloud, Adobe Market, Instagram, Facebook, & OneDrive as well as Google Image Search – all from within the app. 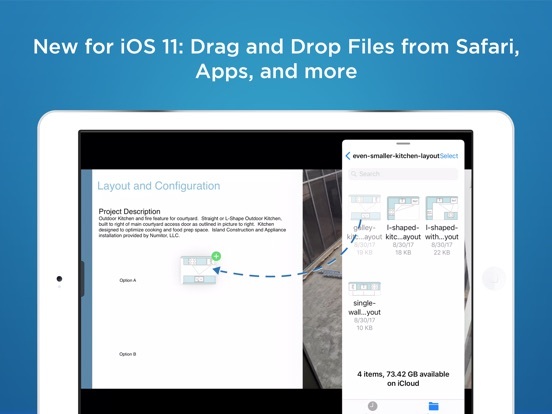 Your Flows are saved in the cloud, you never have to worry about having access to your presentations. Our web player makes it possible to share your presentation with anyone, on any device, no account or special app is required. Share your work with anyone on any device - no account or special app is. If you want to keep things PRIVATE, you can do that too! We offer SEVERAL PRIVACY LEVELS so that your content is only seen by those with whom you wish to share. Use videos, PDFs and PSDs saved in your Adobe Cloud. You can even select a specific layer from within a PSD file. 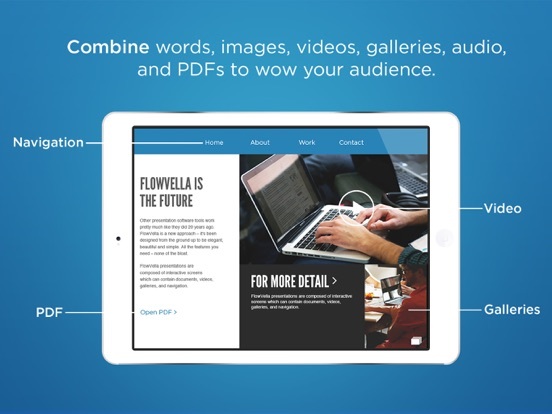 FlowVella is free to download and use and comes with the ability to post 4 public flows. 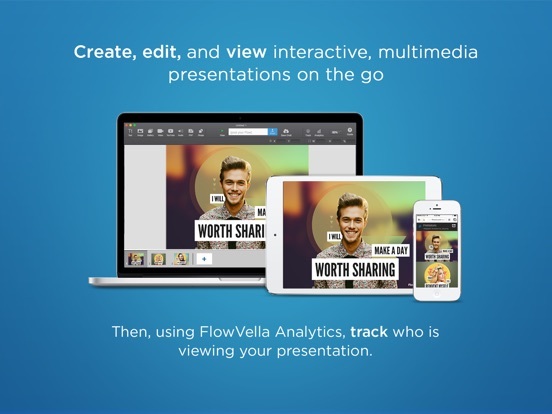 For extended functionality and more features, FlowVella has two paid plans, Premium and PRO. Premium is available through an auto-renewing subscription for $4.99/month or $49.99/year and PRO is $19.99/month or $199.99/year. Premium allows for more privacy options, more screens and unlimited flows. PRO unlocks Kiosk Mode and other features for professional use. Subscriptions will be charged to your credit card through your iTunes account. Your subscription will automatically renew unless cancelled at least 24-hours before the end of the current period. You will not be able to cancel a subscription during the active period. Manage your subscriptions in Account Settings after purchase. 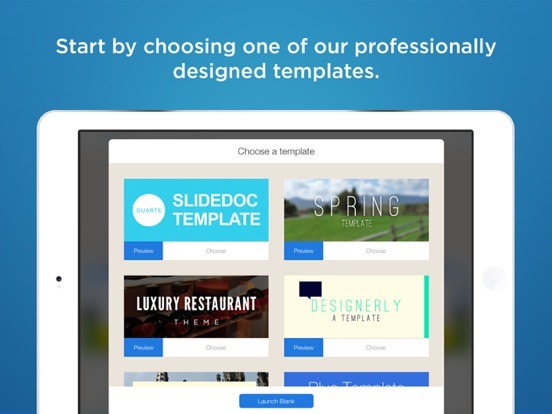 Flowboard is the best presentation app ever. It has allowed me to make my presentations more engaging... I love the developers they are a great team and that are amazing and so helpful. Flowboard is my #1 app for my Mac and iPad. Great to work with! Great for business presentations! So much customization! Flowboard is without a doubt a great APP! For those who require a visual platform, this is the app of the future. With many stunning features and easy to use layouts, Flowboard works great if you're looking to put together a visual book/catalogue which makes for beautiful presentations.